For the last 6 years I’ve been using a Canon MX 870 printer. It was a good printer, the quality was fine and I liked the fact that it had multi-functions and 2 paper trays. However there was one fatal flaw with the device that meant that it just had to go! For some time now (years, probably) the printer has suffered from an identity crisis. Sometimes it would happily advertise itself as available on my network and churn out prints. Other times, it would be switched on and active however not show up on any device. Worse still was when it sat somewhere in the middle – advertising the fact that it would accept prints but then blatantly ignoring all my requests to actually do so. The problem was “error 300”. Lots of people seem to get this with Canon MX series printers. It’s all over support forums on the interwebs and not just for Mac users (although OS X does some to be prone to it). 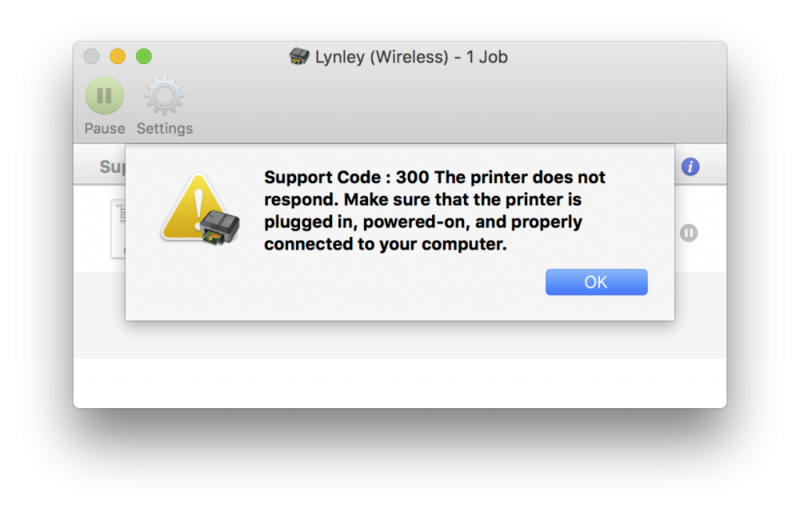 After suffering with this issue for far too long, I decided earlier this summer that the printer had to go. I started looking around for an alternative. I’d first come across the Epson EcoTank series when it was released in 2015. I like this concept very much. These printers don’t use traditional cartridges, instead they have large ink tanks on the side into which you squirt the liquid that will ultimately make up your prints. The ink is cheap and because the tanks are so large Epson claim that you can do somewhere in the region of 11,000 pages once you’ve filled up. Obviously this depends on how much coverage there is on the paper, but however you look at it, this is considerably more than cartridge hardware can manage. Because the ink is so cheap, Epson make their money on charging more for the printer. If the EcoTank 4550 was a “normal” printer it would likely be a third of the price but then you’d end up paying more for inks. Even if you use third party options (some of which are pretty awful) the cost per page is still going to be much higher than the 0.5p of the Epson. I’ve posted a video review of the Epson EcoTank 4550 to my YouTube channel. You can view that here. In it, I unbox the printer, add the ink, set it up with my Mac Pro and then try some test prints before giving my overall impressions of the unit. The video was recorded in June 2016 and added to YouTube on 10 September (I take my time editing, clearly). Other EcoTank models are available with different features to the model I review. Check out the Epson web site in your local country for details. I mention special offers in my review, both of which have now ended. I am not writing this review or posting my video with the knowledge or support of Epson. I purchased the hardware as a consumer using my own money and my comments are entirely down to what I think of it. You should always take on board a variety of opinions and decide yourself what to do before making any purchase. This entry was posted in Computing, Hardware, Technology on September 10, 2016 by AJClayton.